The Jensen Mixer Series 500 Drive Train is supported entirely by the tank manway or nozzle. No tie rods, bases or other external supports are used. Lightweight and low-overhang design are the keys to this money saving feature. 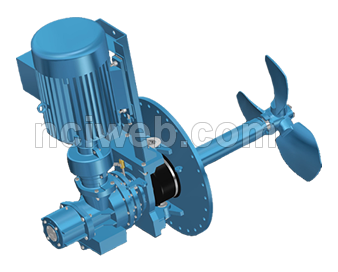 Support for the propeller shaft is provided by the main thrust bearing at the outboard end of the mixer and by the shaft end bearing close to the tank shutoff device. With this long bearing span, any possibility of shaft whip is virtually eliminated. A – The tank shutoff device is keyed to the shaft and seated against the propeller. Corrosion resistant materials and self-cleaning design assure positive sealing even after years of service. With the shutoff engaged, all parts of the mixer, including the shaft end bearings, may be removed for maintenance. B – The end bearing material is solid tungsten carbide for greatest resistance to wear in the most abrasive environments and is housed in a removable assembly permitting replacement without removal of the mixer from the tank. C – The tungsten carbide coated wear sleeve is designed to provide maximum protection to the mixer shaft. The tungsten carbide contact surfaces of the end bearing and wear sleeve assure long life and superior wear characteristics.